(Chicken Exploitation - Egg Production - 06) This photo gives us a closer look at a single battery cage. Typically, four to five egg laying hens are packed into a wire battery cage which has a floor the size of a folded newspaper. They cannot even stretch their wings. 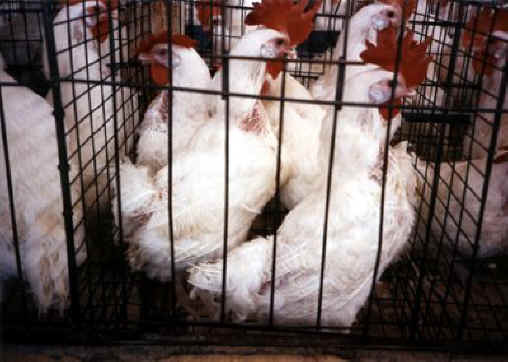 Stop this evil and cruel treatment of chickens. Stop eating eggs!